I recently sat down to think about how life has changed the longer we’ve been on the road of homeschooling, and I started to notice how much I had changed as a homeschooling mom. 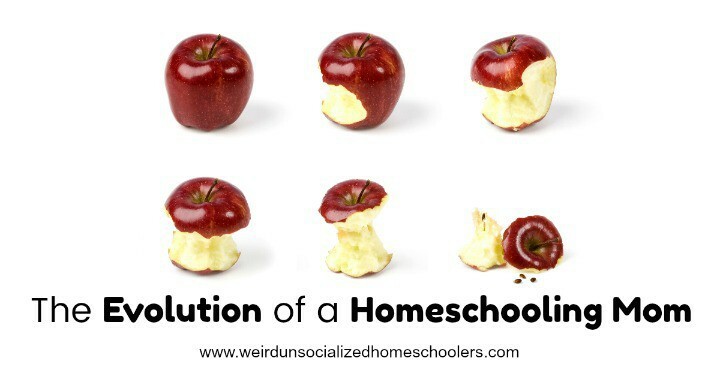 The evolution of a homeschooling mom is a curious thing. If you’ve been homeschooling for awhile, maybe some of these changes are true for you as well. 1. You don’t push it in people’s face. Y’all, in the beginning, homeschooling is a thing, and it’s the thing you do. When starting out on the journey of homeschooling—let’s be honest—some folks can be pretty in your face about it. They’re extra confident about the why, how, and the supposed superiority of it, and they’re more than ready to tell you about it all. It’s the first thing on their lips. They can work it into any conversation. Some of this is because they’re excited. Some of this is because they feel uber blessed to have the opportunity. But sometimes it’s just because homeschooling is. the. thing. to. talk. about. Years down the road, homeschooling is still what you do, it’s just less of a thing to tell people about. It’s not your go-to topic. You don’t feel you’ve got a bone to pick with Random Joe on the Street about all things education. In fact, you may go entire conversations without even mentioning your title of Awesome Homeschooling Parent. This might be because as your kids get older, you’re less hands-on and they’re more independent, so homeschooling isn’t right in your face all day. But I also think that it’s because we settle into the comfort and familiarity of our life choice, and our day-in-day-out with that choice makes Awesome Homeschooling Mom seem less worthy of a ta-da! sort of presentation. 2. You eat a lot of crow. In the beginning years of homeschooling, many homeschooling moms can seem pretty sure about the path their homeschooling journey will take. They know their kids. They know their kids’ interests and how their kids learn. Because of this, moms may be overly confident about what the future holds. Except that none of us knows what the future holds. The daughter you thought didn’t want structure actually ends up craving it a few years down the road. The son who couldn’t get his nose out of a book as an elementary kid doesn’t want to touch a book in high school. Maybe your son really ends up liking math and science, but your forte is history and art—so you struggle with how to help him excel. Maybe your introvert daughter doesn’t want to get involved in anything, but you want her to go out and do everything. In the midst of all this, you end up taking back a lot of things you thought or said about other methods of homeschooling, curriculum choices, and schedule set-ups—because you end up having to try them out! Remember all those times you said, “Well if that parent would just tell their kids…” or “I don’t know why that set up doesn’t work for them, they just need to…” ? Yeah. You end up eating all that stuff, and more. 3. You notice the value in all the different methods. You start off on the path of homeschooling, and you know what method looks good. You’ve researched. You’ve figured it out. You know it’s gonna work in your house! And one method usually does work for a while. The longer you homeschool, the wider variety of homeschooling methods you will use, and the more homeschool labels you will find yourself able to fit underneath comfortably. See, in the beginning, homeschooling can seem very cut and dry: I will unschool my kids. I will use Charlotte Mason principles. I will do school-at-home. But I think most of us—at least the majority of near-the-end homeschoolers I’ve talked to—end up as what I like to call a solid mix of eclectic homeschool awesomeness at some point. We do what works, right? And what works is always changing. That’s the beauty of homeschooling. And you get more comfortable with that the longer you homeschool. 4. You notice potential downfalls to the homeschooling lifestyle. Now that some of my kids’ older friends are entering college, I see the things that we’ve done really well in preparing our kids for their future plans, and other things we maybe should work harder on as they head in that direction. If we can be completely honest, it’s common to hear in the homeschool world, “Oh, they won’t really need that” or “When will they actually use that?” And yet, you don’t really know that until you’re staring their (surprise!) future down and they’re asking for extra help on Subject and Skill XYZ because you chose not to teach it, thinking they wouldn’t need it. Likewise, a homeschool graduate told me she wished she would have focused more on math when she was younger because as an adult, she eventually ended up in a career that used a lot of math. When she found interest in that career, she had to do extra work to get caught up. How many of us ended up with the career we dreamed of having when we were 8? 14? 17? We didn’t know where we were going to end up, and we don’t know what lies ahead for our kids, either. The great thing is the longer you homeschool, hopefully the more comfortable you get with admitting the things that don’t work, what you are and aren’t able to teach yourself, or the extra work required to keep a particular kid of yours from slipping into cracks of teen apathy, instead of towards a bright future. 5. You forget what it was like starting out. Going back and re-reading things I wrote about our very early years of homeschooling is interesting because there is so much stuff I completely forgot had even happened. I’d forgotten the struggles. I had forgotten the things I was hyper-focused on. I’d forgotten everything I was worried about. I’d forgotten all the things I’d assumed were going to happen. It’s sometimes easy to write off the fears, anxieties, and struggles of newer homeschooling parents simply because we’ve seen the other side (or are close to it) and know that everything turns out ok. Sometimes our advice and experience can be inspiring and comforting, and other times it just makes us look like people who are too far removed and don’t remember what it’s like to be in that place. 6. You trust the process more. At some point on the homeschooling journey, you stop wondering if you did the right thing because—quite simply—you realize that homeschooling is the thing you did. There are struggles and worries at every stage of the homeschooling game. Issues don’t go away, they just change. But you get to a place where a new kind of confidence takes over. You trust yourself, you trust your kids, and you trust in the amazing life you’ve chosen to live. Trust in the journey, and celebrate no matter where you are along the path. How has homeschooling changed for you since you began? This article totally resonated with me today. I am finishing my 18th year of homeschooling–one year left!– and in the process today of preparing for our support group’s Homeschooling 101 this weekend. And… all that beginning stuff seems to far away and vague now. I loved this line: “Sometimes our advice and experience can be inspiring and comforting, and other times it just makes us look like people who are too far removed and don’t remember what it’s like to be in that place.” I’m trying to put myself back in that place–and it’s hard! Homeschooling is just who we are. We forget where we came from–and it’s so important to remember that in order to connect with new homeschoolers.